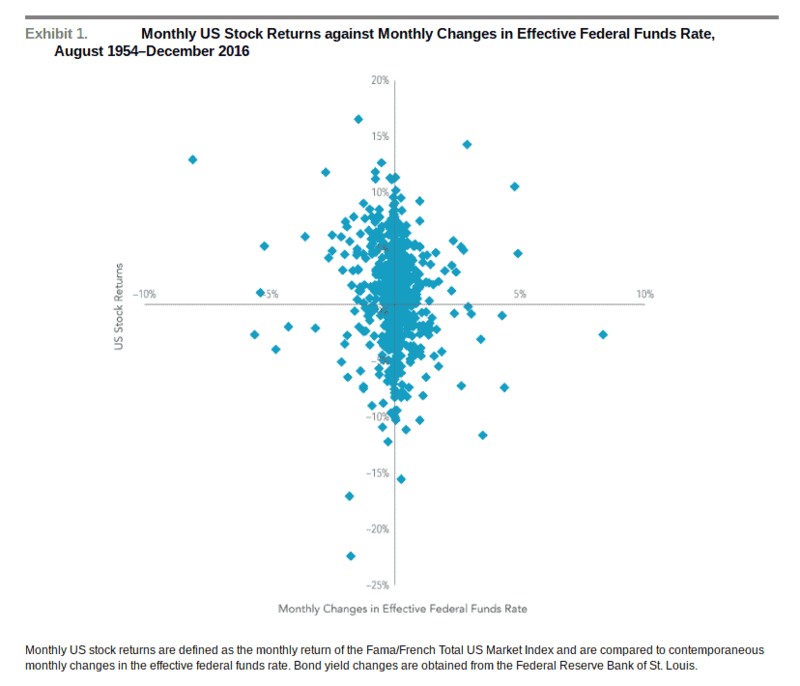 » When Interest Rates Go Up, Do Stocks Go Down? Unlike bond prices, which tend to go down when yields go up, stock prices might rise or fall with changes in interest rates. For stocks, it can go either way because a stock’s price depends on both future cash flows to investors and the discount rate they apply to those expected cash flows. When interest rates rise, the discount rate may increase, which in turn could cause the price of the stock to fall. However, it is also possible that when interest rates change, expectations about future cash flows expected from holding a stock also change. So, if the theory doesn’t tell us what the overall effect should be, the next question is what does the data say? Results shown during periods prior to each Index’s index inception date do not represent actual returns of the respective index. Other periods selected may have different results, including losses. Backtested index performance is hypothetical and is provided for informational purposes only to indicate historical performance had the index been calculated over the relevant time periods. Backtested performance results assume the reinvestment of dividends and capital gains. Eugene Fama and Ken French are members of the Board of Directors for and provide consulting services to Dimensional Fund Advisors LP. There is no guarantee investment strategies will be successful. Investing involves risks including possible loss of principal. All expressions of opinion are subject to change. This article is distributed for informational purposes, and it is not to be construed as an offer, solicitation, recommendation, or endorsement of any particular security, products, or services.